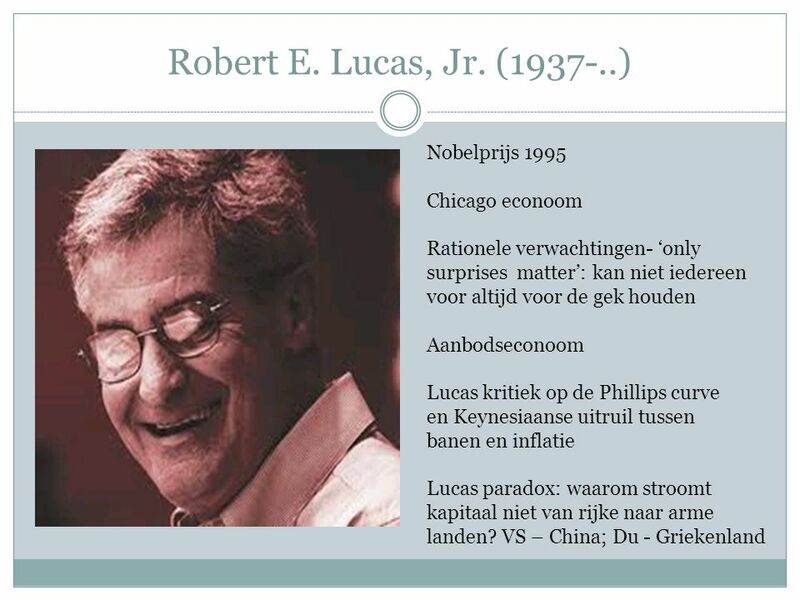 I. GESCHIEDENIS VAN HET ECONOMISCH DENKEN II. 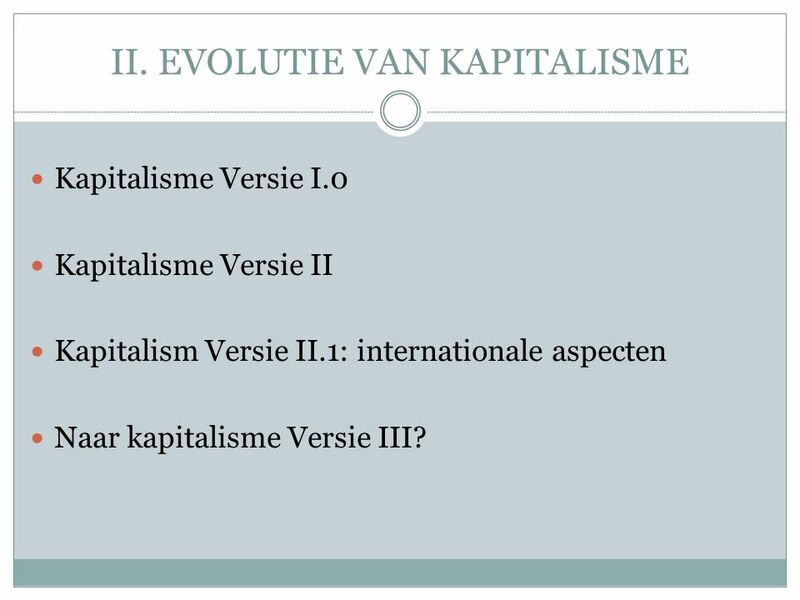 EVOLUTIE VAN KAPITALISME III. 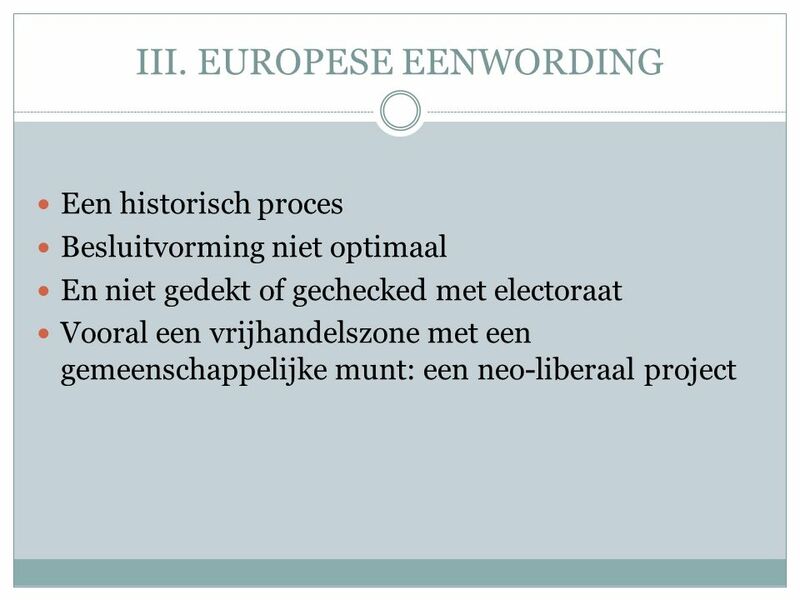 PROCES VAN EUROPESE EENWORDING IV. 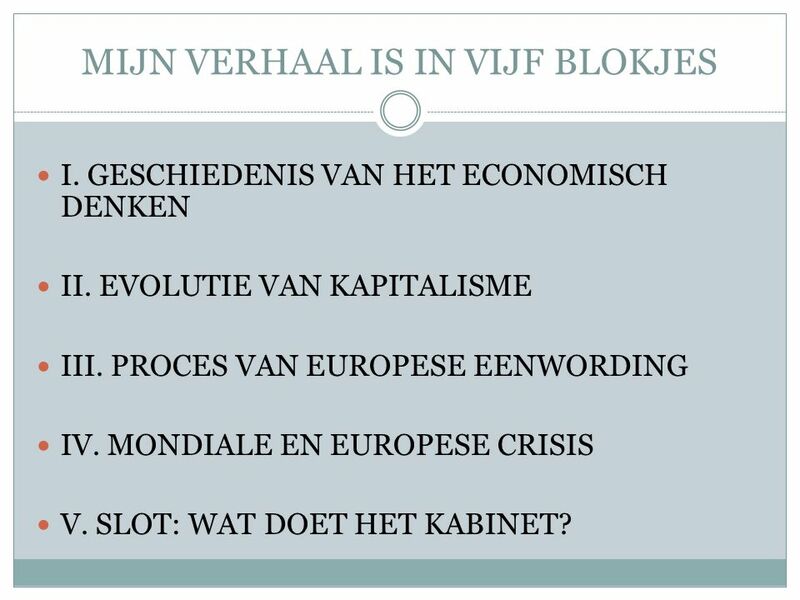 MONDIALE EN EUROPESE CRISIS V. SLOT: WAT DOET HET KABINET? 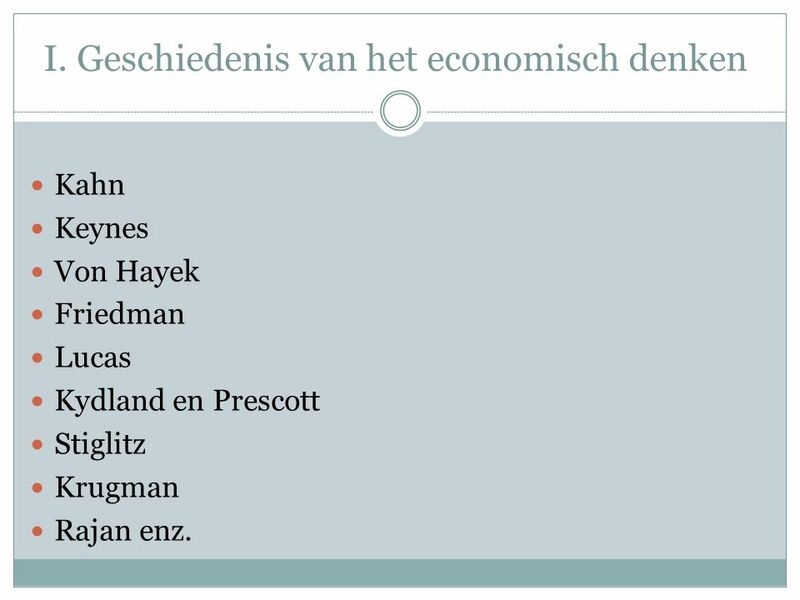 Kahn Keynes Von Hayek Friedman Lucas Kydland en Prescott Stiglitz Krugman Rajan enz. 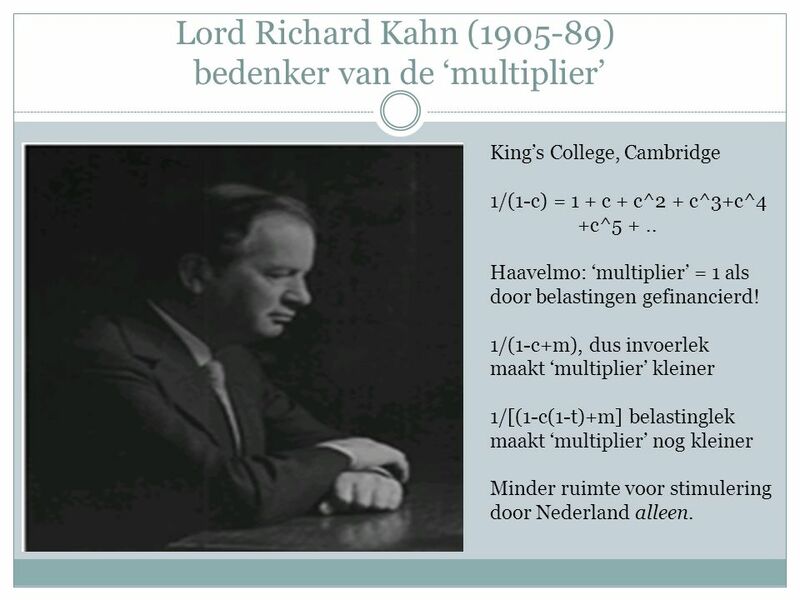 King’s College, Cambridge 1/(1-c) = 1 + c + c^2 + c^3+c^4 +c^5 + .. Haavelmo: ‘multiplier’ = 1 als door belastingen gefinancierd! 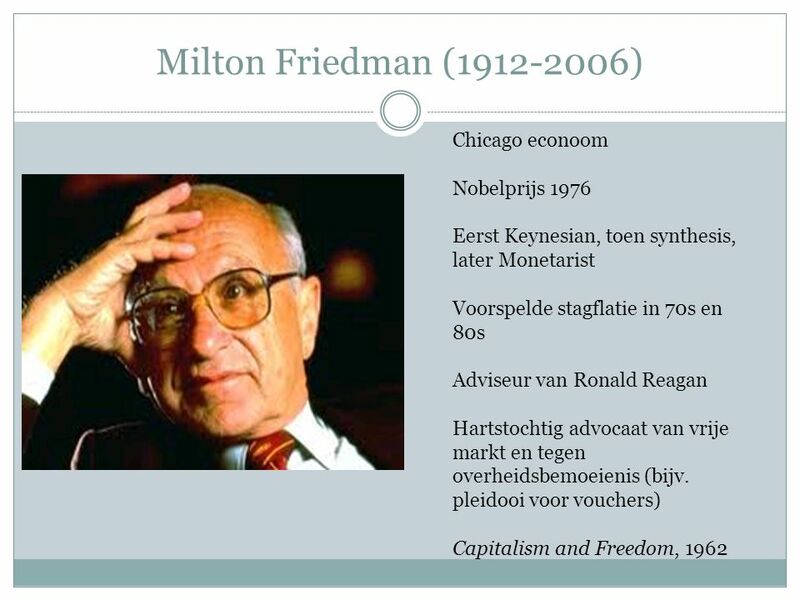 1/(1-c+m), dus invoerlek maakt ‘multiplier’ kleiner 1/[(1-c(1-t)+m] belastinglek maakt ‘multiplier’ nog kleiner Minder ruimte voor stimulering door Nederland alleen. Kapitalisme Versie I.0 Kapitalisme Versie II Kapitalism Versie II.1: internationale aspecten Naar kapitalisme Versie III? 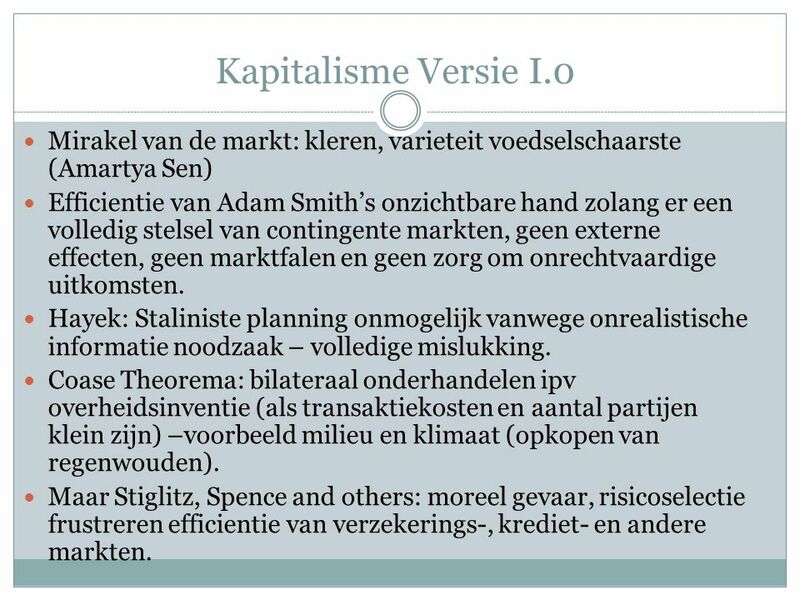 13 Kapitalisme Versie I.0 Mirakel van de markt: kleren, varieteit voedselschaarste (Amartya Sen) Efficientie van Adam Smith’s onzichtbare hand zolang er een volledig stelsel van contingente markten, geen externe effecten, geen marktfalen en geen zorg om onrechtvaardige uitkomsten. 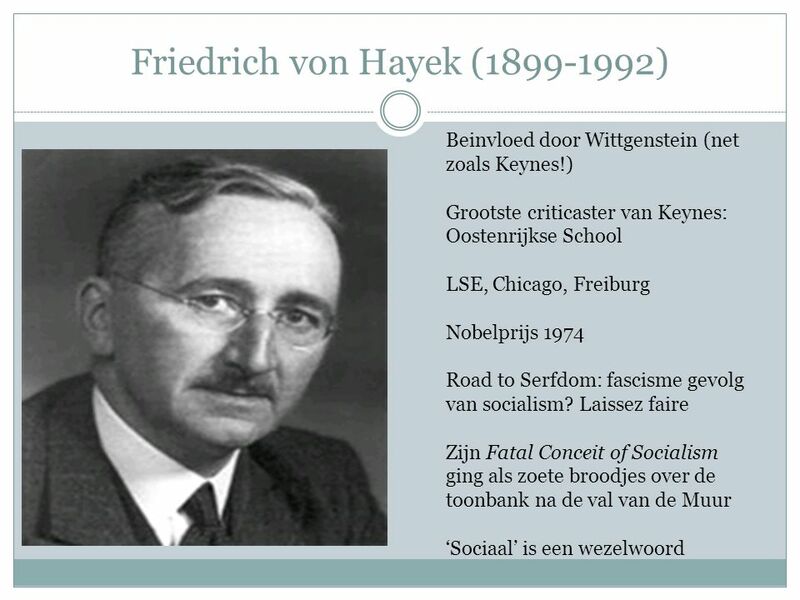 Hayek: Staliniste planning onmogelijk vanwege onrealistische informatie noodzaak – volledige mislukking. 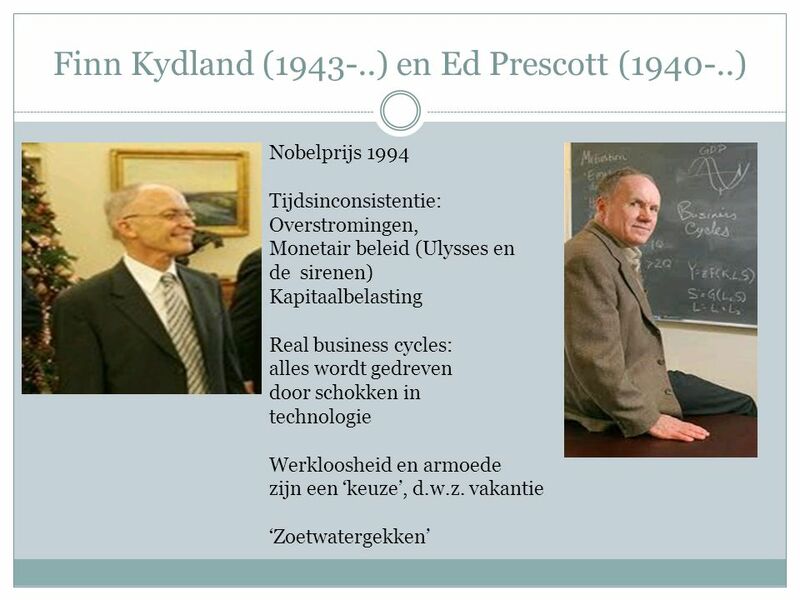 Coase Theorema: bilateraal onderhandelen ipv overheidsinventie (als transaktiekosten en aantal partijen klein zijn) –voorbeeld milieu en klimaat (opkopen van regenwouden). 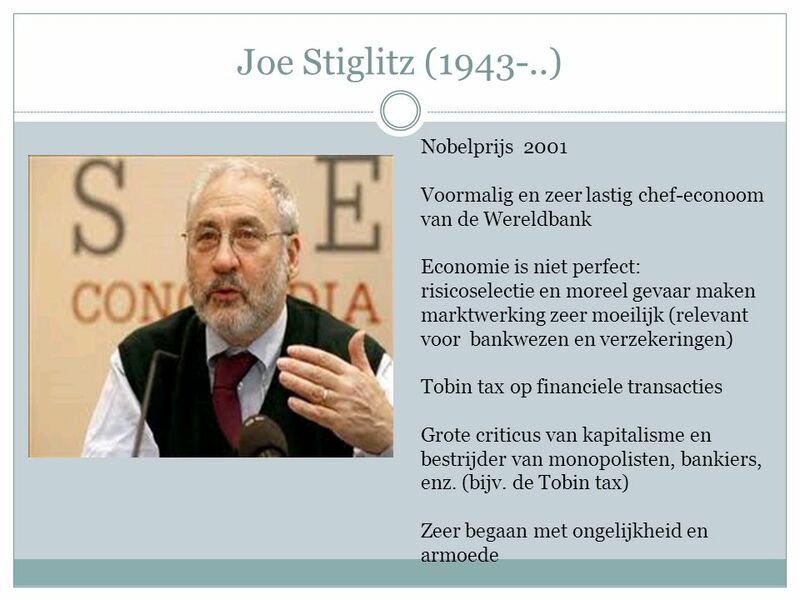 Maar Stiglitz, Spence and others: moreel gevaar, risicoselectie frustreren efficientie van verzekerings-, krediet- en andere markten. 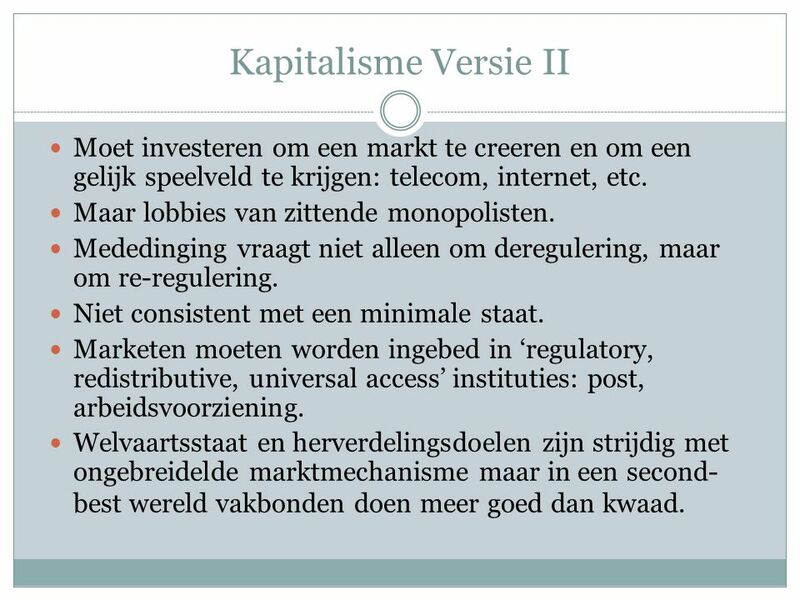 14 Kapitalisme Versie II Moet investeren om een markt te creeren en om een gelijk speelveld te krijgen: telecom, internet, etc. Maar lobbies van zittende monopolisten. Mededinging vraagt niet alleen om deregulering, maar om re-regulering. Niet consistent met een minimale staat. 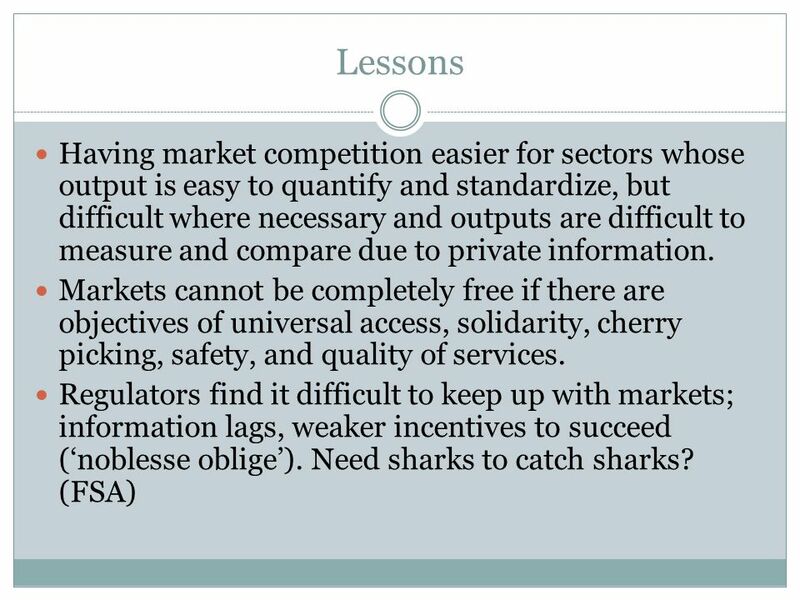 Marketen moeten worden ingebed in ‘regulatory, redistributive, universal access’ instituties: post, arbeidsvoorziening. Welvaartsstaat en herverdelingsdoelen zijn strijdig met ongebreidelde marktmechanisme maar in een second-best wereld vakbonden doen meer goed dan kwaad. 15 Wat werkt of kan geen kwaad? Telecom. 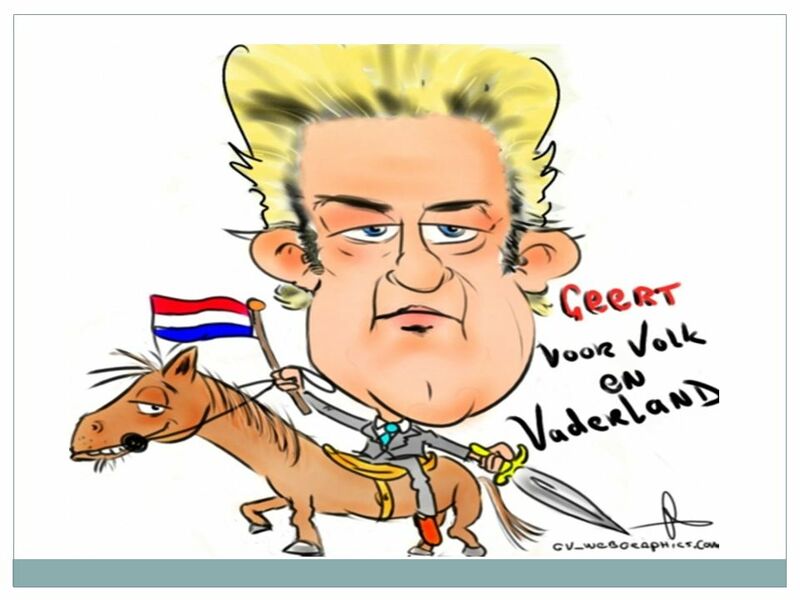 NMA: vele ‘normale’ markten van cement tot cd’s en andere homogene goederen Sociale zekerheid – flexi-curity. Landen met grote welvaartsstaat en veel herverdeling hebben hogere economische groei zolang overdrachten geconditioneerd zijn en wederkerigheid geldt. 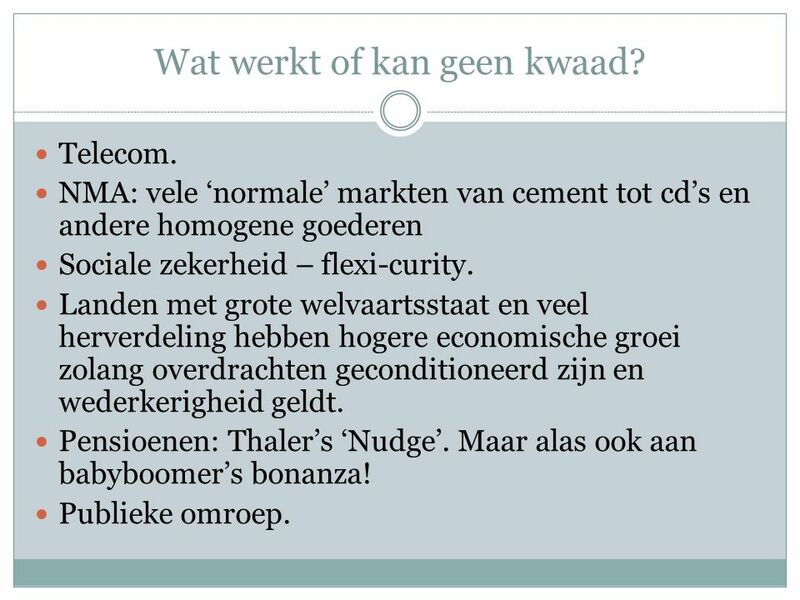 Pensioenen: Thaler’s ‘Nudge’. Maar alas ook aan babyboomer’s bonanza! Publieke omroep. 16 Waar kan het fout gaan? Financiele supervisie! Hervorming van de zorg: risicoselectie (cherry picking) en moreel gevaar. Privatisering corporaties: bouwen van luxe woningen in de Antillen enz. (?). Tenders in constructie van grote projecten: corruptie. Competitie in de taxi branch: geen geloofwaardige supervisie of enforcement. Competitie in het notariaat, bij makelaars, verzekeringsagenten en financiele tussenpersonen. Zie ook omzet-gedreven handen van internationale advokaten. Integriteit?. Enforce rules and laws (e.g., Arbeidsinspectie). 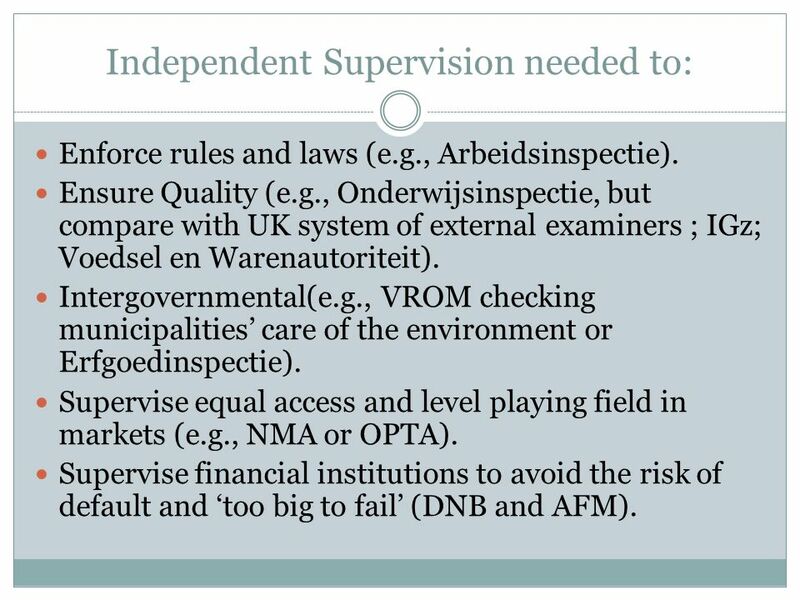 Ensure Quality (e.g., Onderwijsinspectie, but compare with UK system of external examiners ; IGz; Voedsel en Warenautoriteit). Intergovernmental(e.g., VROM checking municipalities’ care of the environment or Erfgoedinspectie). 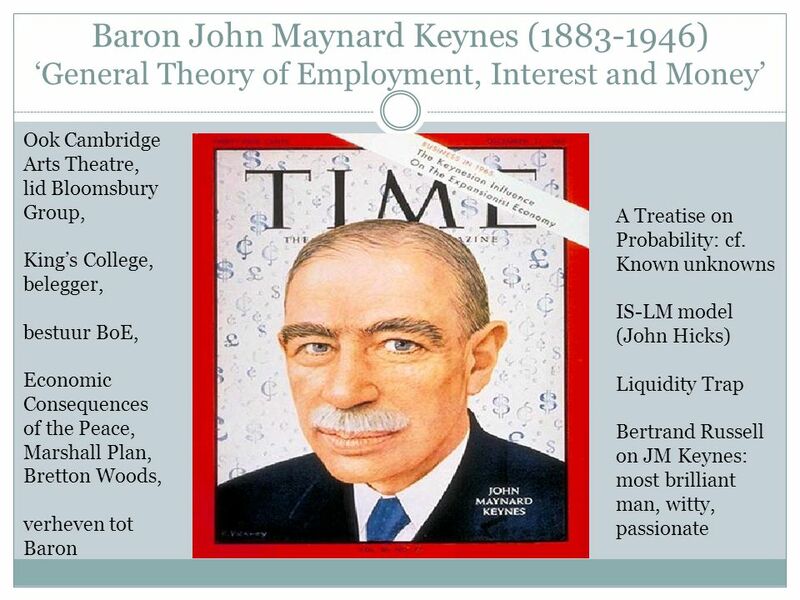 Supervise equal access and level playing field in markets (e.g., NMA or OPTA). Supervise financial institutions to avoid the risk of default and ‘too big to fail’ (DNB and AFM). Not enough teeth to bite. Cannot keep up with the field: always behind with information. Cannot always attract the best people (salaries?). Employees are too often bureaucrats, more interested in ex-post checks than ex-ante prevention. Who supervises the supervisor? Supervisors are often asked to neglect duties by politicians: see subprime crisis in US where mortgage authorities were encouraged to lend to poor, risky households because there is no political support for proper redistribution and welfare state in the US (and UK). 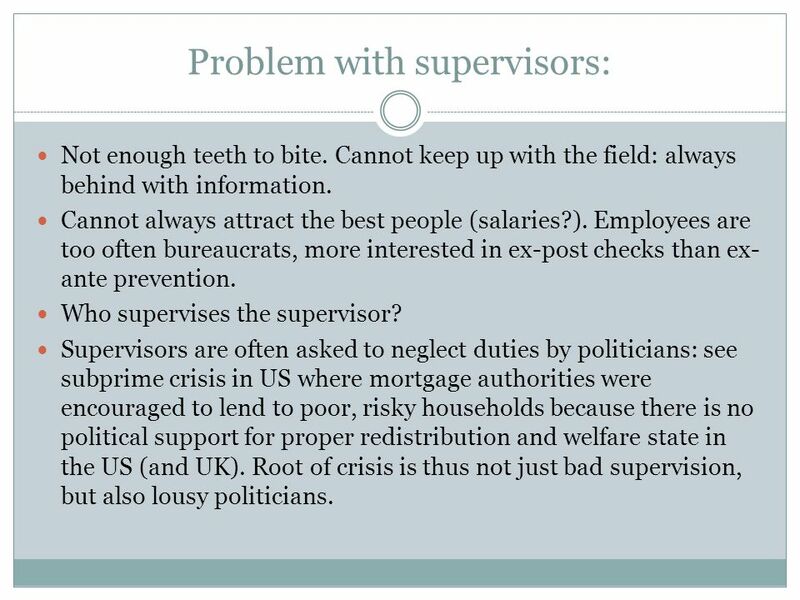 Root of crisis is thus not just bad supervision, but also lousy politicians. 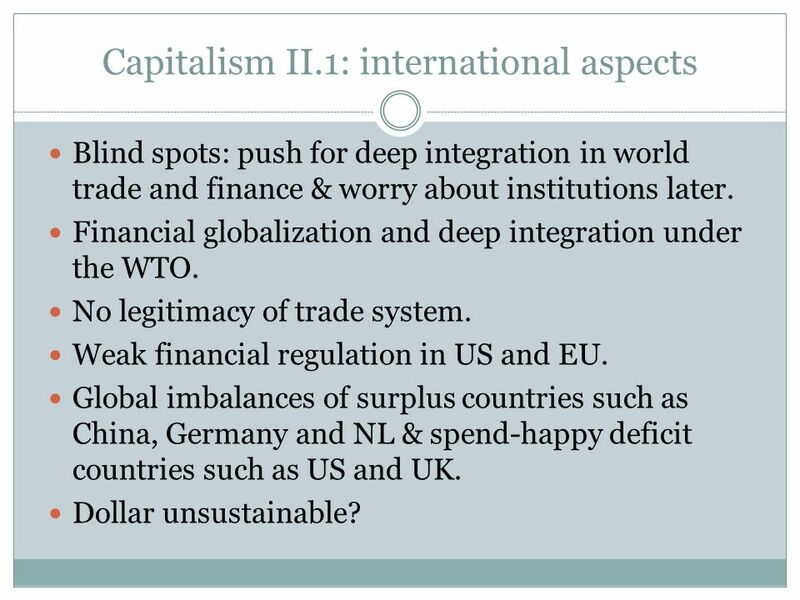 Blind spots: push for deep integration in world trade and finance & worry about institutions later. 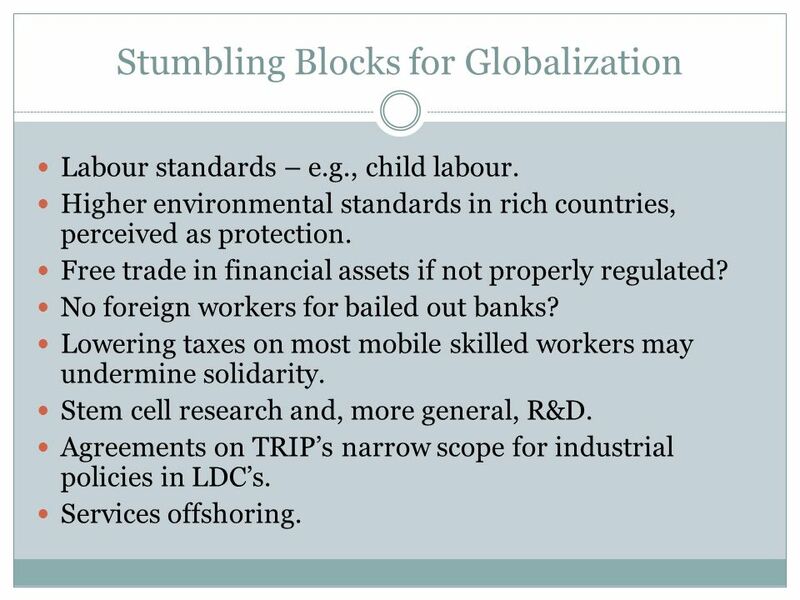 Financial globalization and deep integration under the WTO. No legitimacy of trade system. Weak financial regulation in US and EU. Global imbalances of surplus countries such as China, Germany and NL & spend-happy deficit countries such as US and UK. Dollar unsustainable? 21 Towards Capitalism Mark III? Global reach of markets, but governance mostly national. 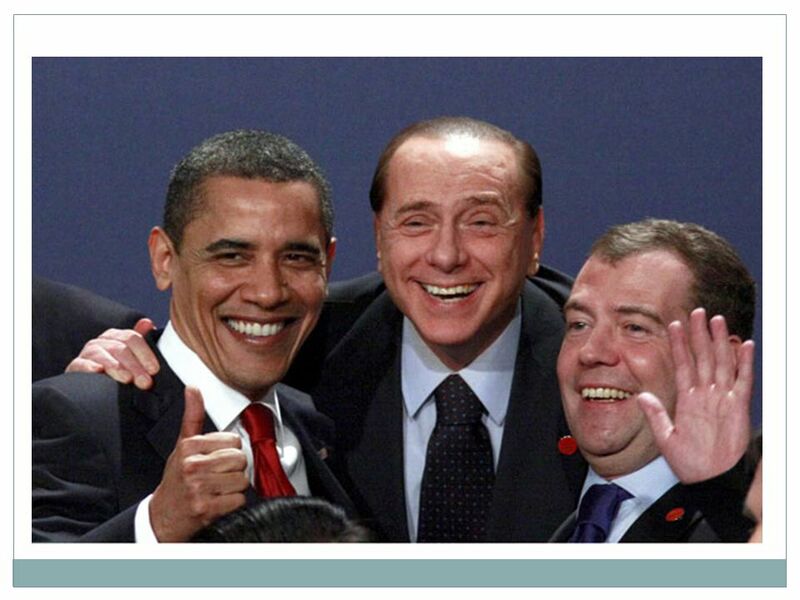 Danger of protectionism (Obama). 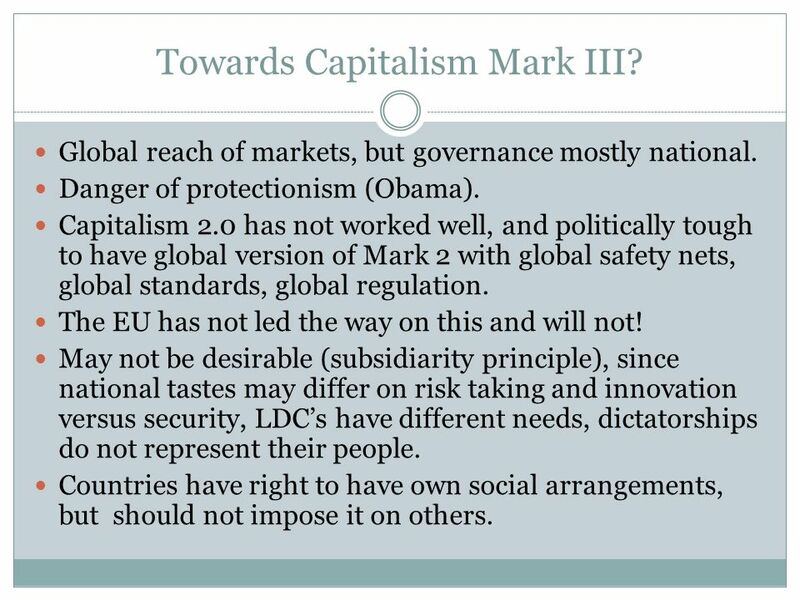 Capitalism 2.0 has not worked well, and politically tough to have global version of Mark 2 with global safety nets, global standards, global regulation. The EU has not led the way on this and will not! May not be desirable (subsidiarity principle), since national tastes may differ on risk taking and innovation versus security, LDC’s have different needs, dictatorships do not represent their people. Countries have right to have own social arrangements, but should not impose it on others. Labour standards – e.g., child labour. Higher environmental standards in rich countries, perceived as protection. 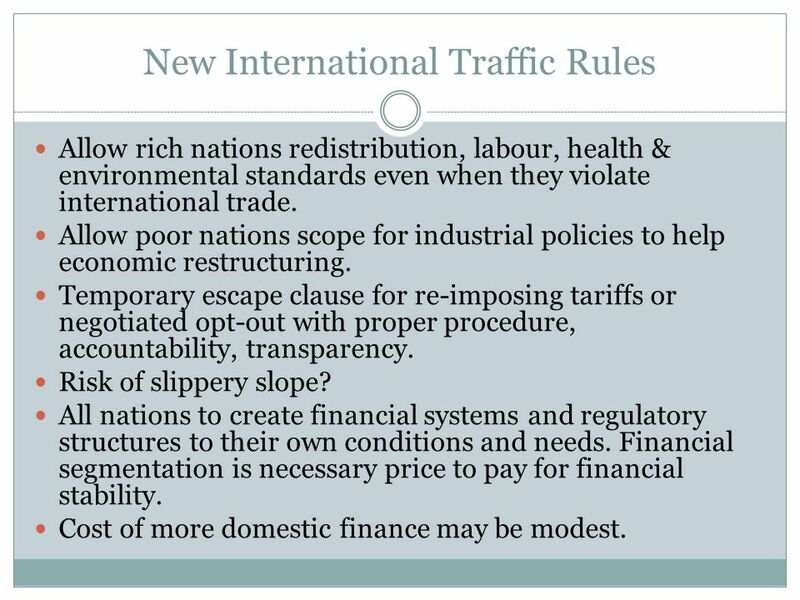 Free trade in financial assets if not properly regulated? No foreign workers for bailed out banks? Lowering taxes on most mobile skilled workers may undermine solidarity. Stem cell research and, more general, R&D. Agreements on TRIP’s narrow scope for industrial policies in LDC’s. Services offshoring. Allow rich nations redistribution, labour, health & environmental standards even when they violate international trade. Allow poor nations scope for industrial policies to help economic restructuring. Temporary escape clause for re-imposing tariffs or negotiated opt-out with proper procedure, accountability, transparency. Risk of slippery slope? All nations to create financial systems and regulatory structures to their own conditions and needs. Financial segmentation is necessary price to pay for financial stability. Cost of more domestic finance may be modest. 25 Robert Schumann ( ) French, devout celibate politician. 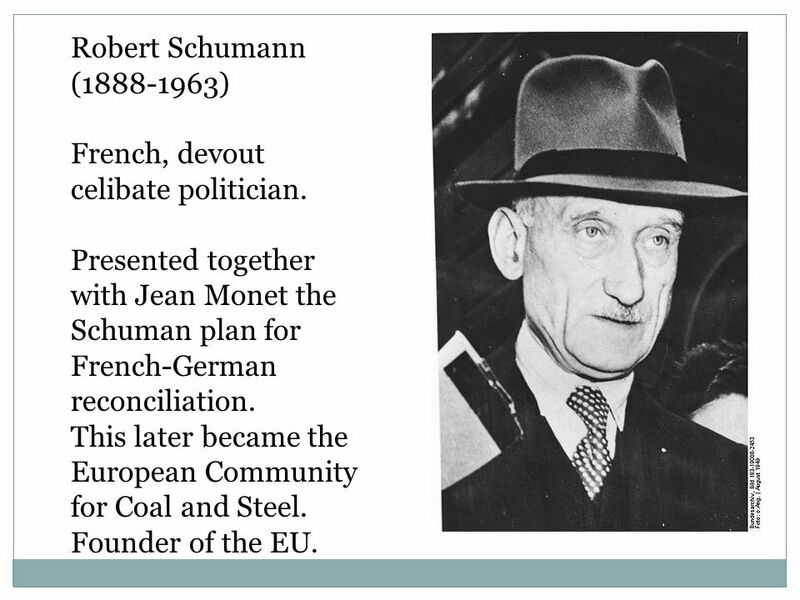 Presented together with Jean Monet the Schuman plan for French-German reconciliation. This later became the European Community for Coal and Steel. Founder of the EU. Reform of European institutions is still in jeopardy while they are unfit to govern an enlarged Europe. European legislators increasingly vote along ideological party lines rather than national lines. Party discipline is strong and increasing. Coalition formation is increasingly determined by ideological closeness rather than party size. 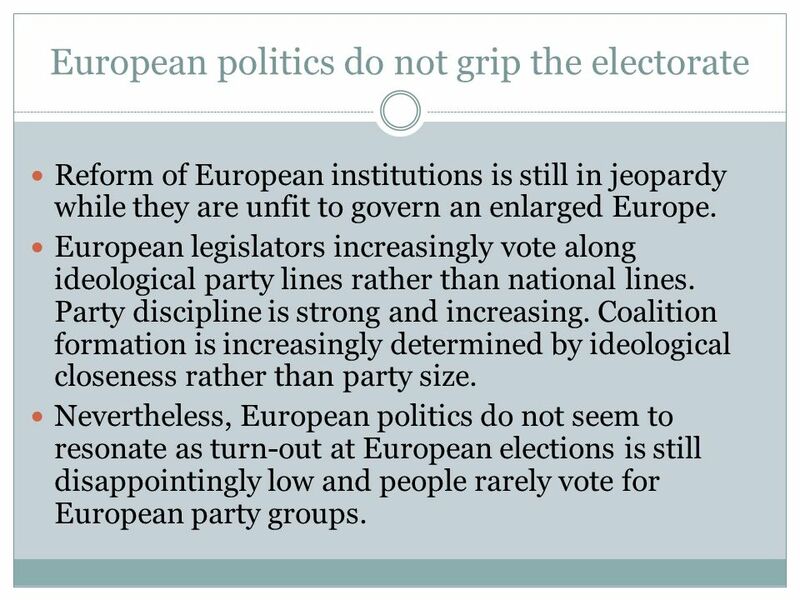 Nevertheless, European politics do not seem to resonate as turn-out at European elections is still disappointingly low and people rarely vote for European party groups. 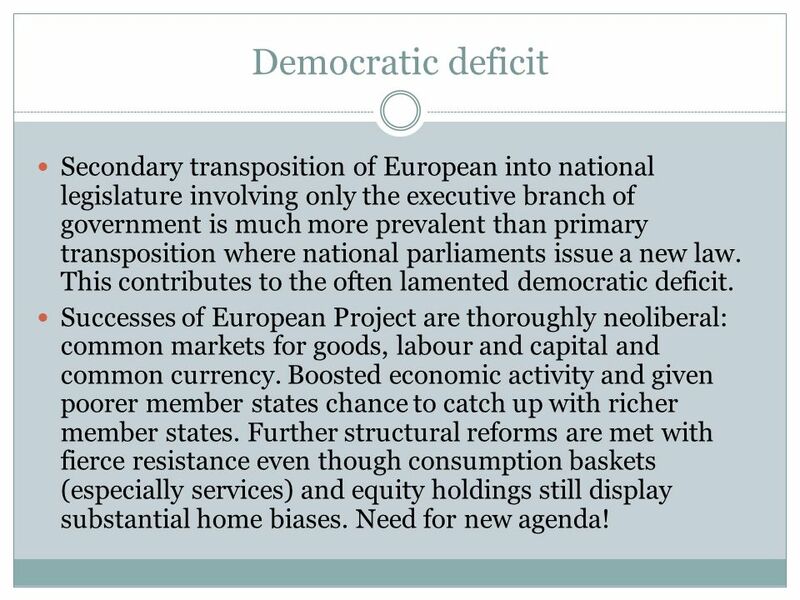 27 Democratic deficit Secondary transposition of European into national legislature involving only the executive branch of government is much more prevalent than primary transposition where national parliaments issue a new law. This contributes to the often lamented democratic deficit. Successes of European Project are thoroughly neoliberal: common markets for goods, labour and capital and common currency. Boosted economic activity and given poorer member states chance to catch up with richer member states. Further structural reforms are met with fierce resistance even though consumption baskets (especially services) and equity holdings still display substantial home biases. Need for new agenda! The Lisbon objectives have failed. Innovation should be driven by competition, higher investments in higher education and R&D, and more reliable financial systems. Further reforms are needed as Europe cannot keep up by simply replicating large-scale production processes. 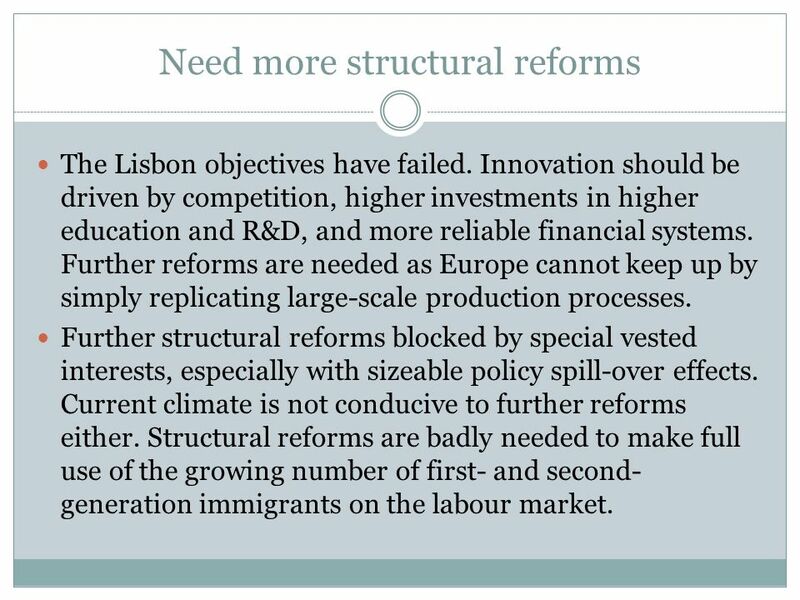 Further structural reforms blocked by special vested interests, especially with sizeable policy spill-over effects. Current climate is not conducive to further reforms either. Structural reforms are badly needed to make full use of the growing number of first- and second-generation immigrants on the labour market. 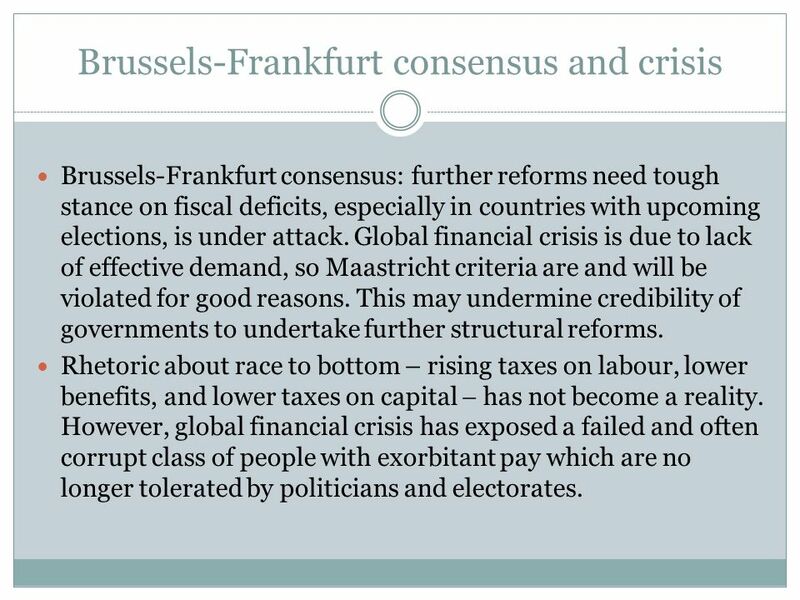 Brussels-Frankfurt consensus: further reforms need tough stance on fiscal deficits, especially in countries with upcoming elections, is under attack. Global financial crisis is due to lack of effective demand, so Maastricht criteria are and will be violated for good reasons. This may undermine credibility of governments to undertake further structural reforms. Rhetoric about race to bottom – rising taxes on labour, lower benefits, and lower taxes on capital  has not become a reality. However, global financial crisis has exposed a failed and often corrupt class of people with exorbitant pay which are no longer tolerated by politicians and electorates. The European Commission has been completely absent in taking the lead to strengthen pan-European financial supervision. Too late and too little! 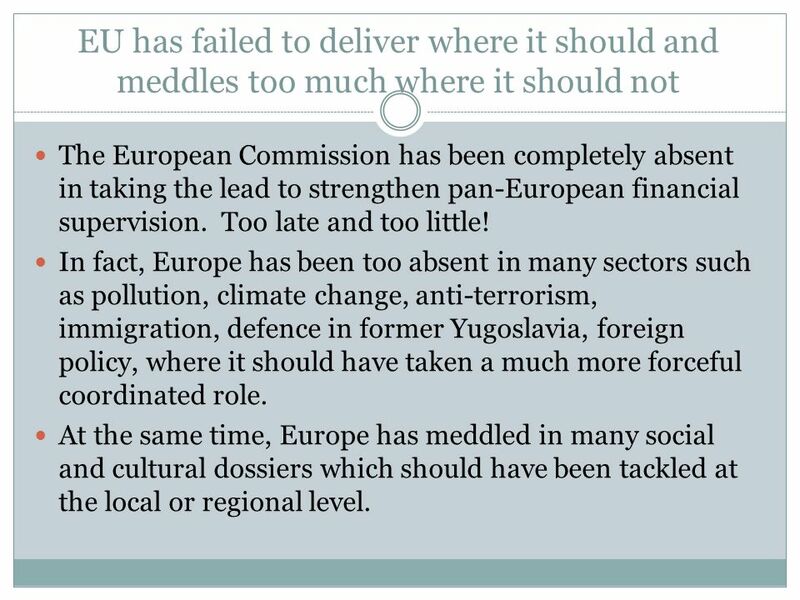 In fact, Europe has been too absent in many sectors such as pollution, climate change, anti-terrorism, immigration, defence in former Yugoslavia, foreign policy, where it should have taken a much more forceful coordinated role. At the same time, Europe has meddled in many social and cultural dossiers which should have been tackled at the local or regional level. 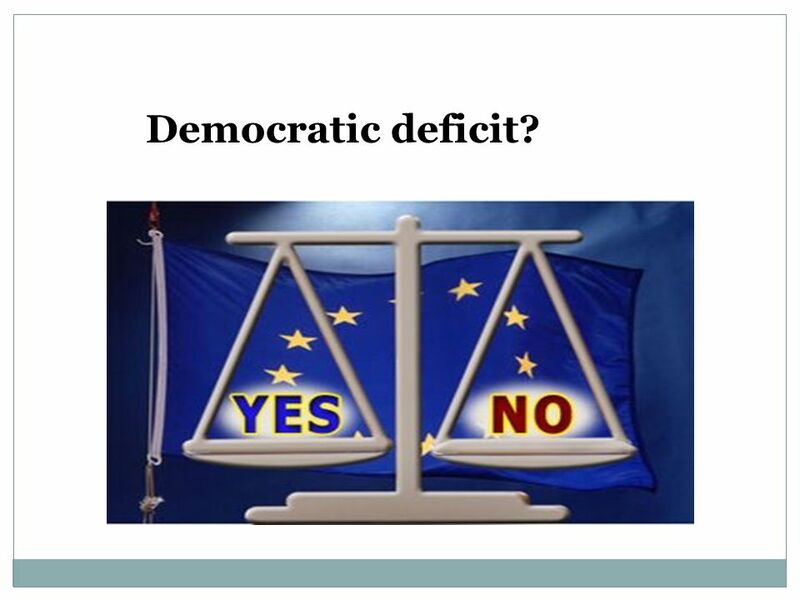 European citizens, even staunch anti-Europeans like the Swedes, support standard fiscal federalism arguments. Violation of the subsidiarity principle has thus undermined support for the European Project. 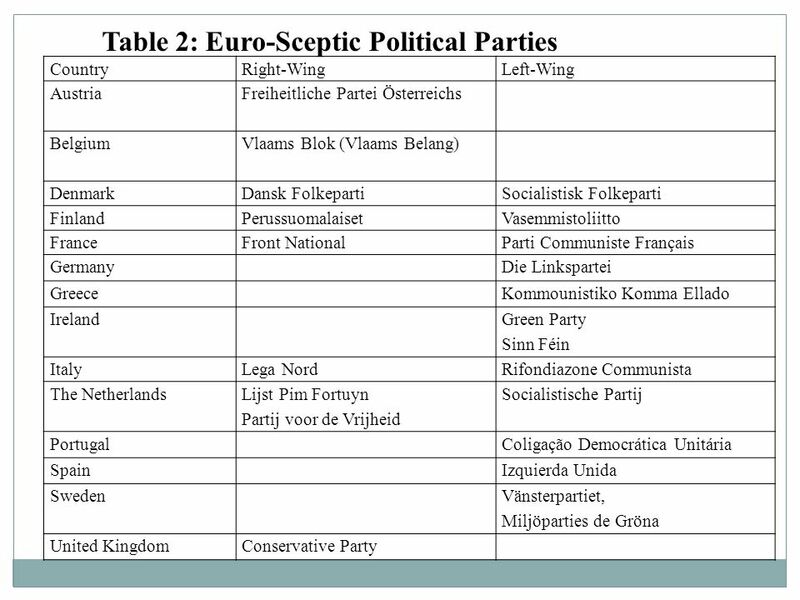 Throughout Europe Euro-scepticism is fuelled by rise of populist left-wing parties who oppose neoliberal reforms of European Project and right-wing parties who defend national sovereignty and identity. 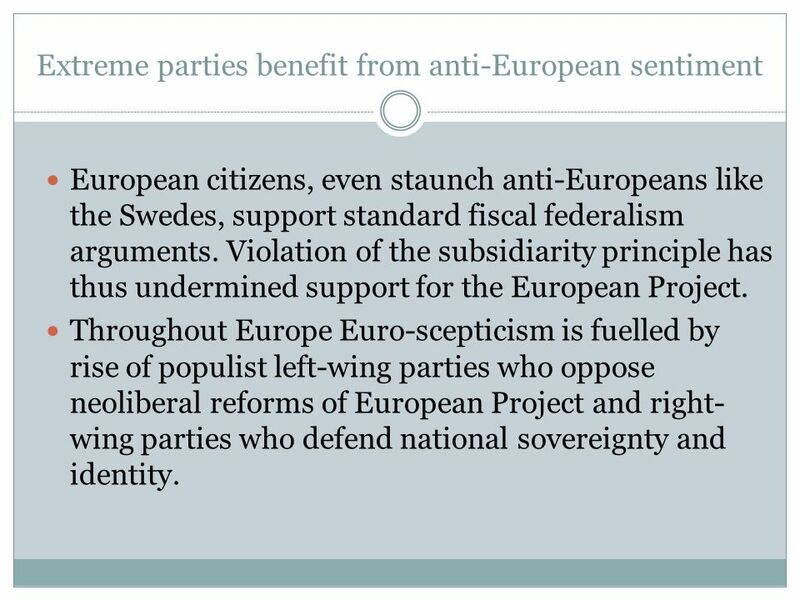 Exclusive national identity, economic anxiety, and especially dissatisfaction with national democracies contribute to Euro-sceptic sentiments and are cued by populist parties. Old arguments in favour of the EU (‘never war again’) fail to impress populist politicians and do not resonate with many young Europeans. 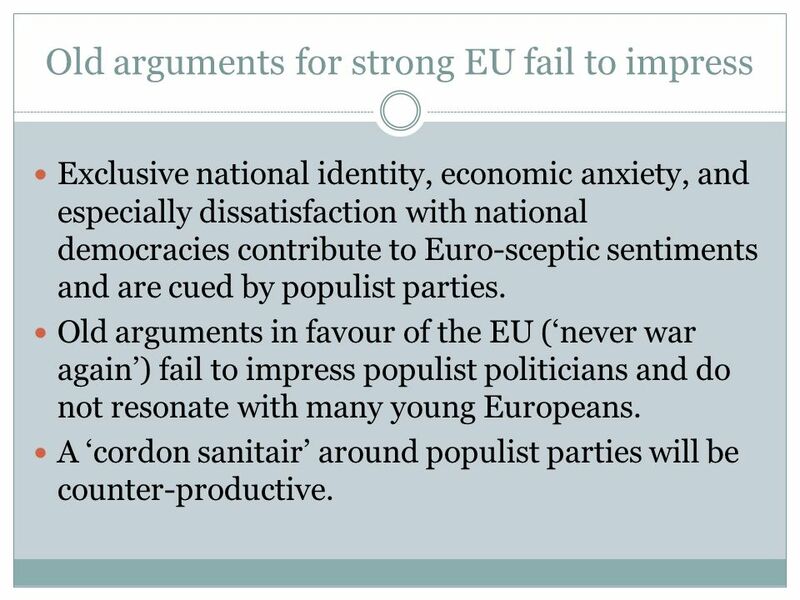 A ‘cordon sanitair’ around populist parties will be counter-productive. Unskilled workers from Central and Eastern Europe and higher income earners in older member states support the EU while manual workers and civil servants in the older member states mistrust the EU. 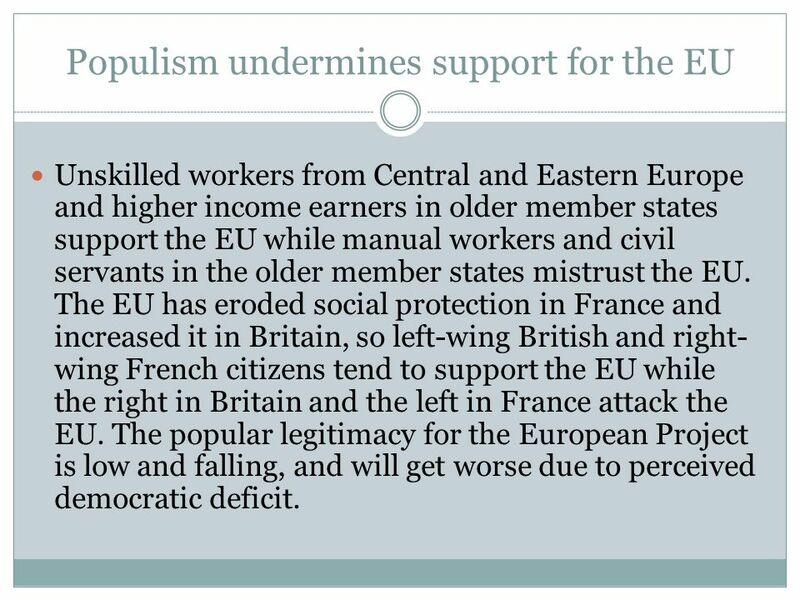 The EU has eroded social protection in France and increased it in Britain, so left-wing British and right-wing French citizens tend to support the EU while the right in Britain and the left in France attack the EU. The popular legitimacy for the European Project is low and falling, and will get worse due to perceived democratic deficit. Speculatieve hausse in aandelen- en huizenmarkten gevoed door hebberigheid, verlagen van kredietstandaarden voor tientallen miljoenen huishoudens, en falen van regulering en supervisie door dogma van laat alles maar aan de markt over. Mogelijk gemaakt door jaren van lage rentevoeten na barsten van dotcom-zeepbel. 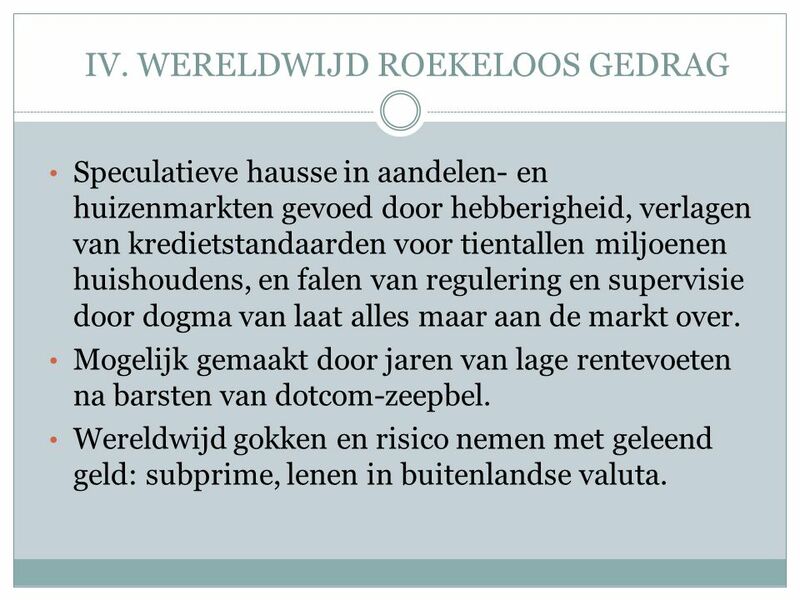 Wereldwijd gokken en risico nemen met geleend geld: subprime, lenen in buitenlandse valuta. 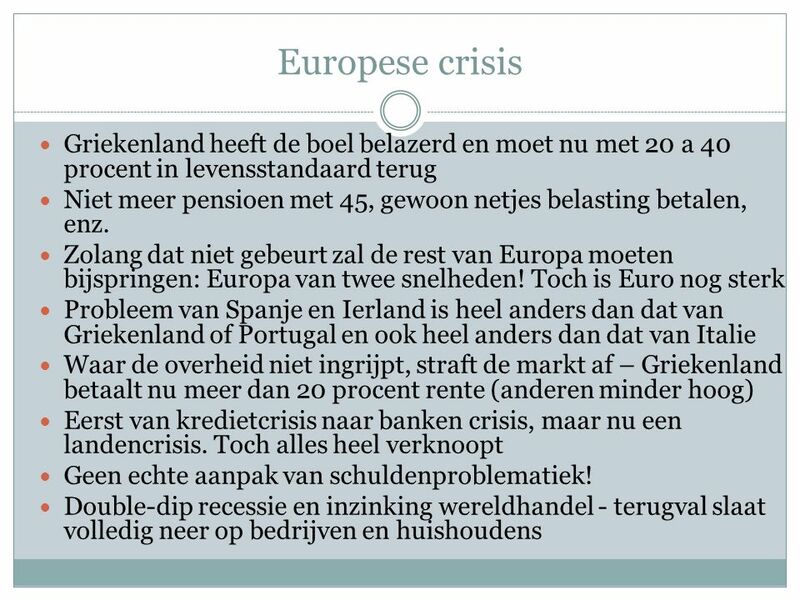 38 Waarom was deze crisis anders? 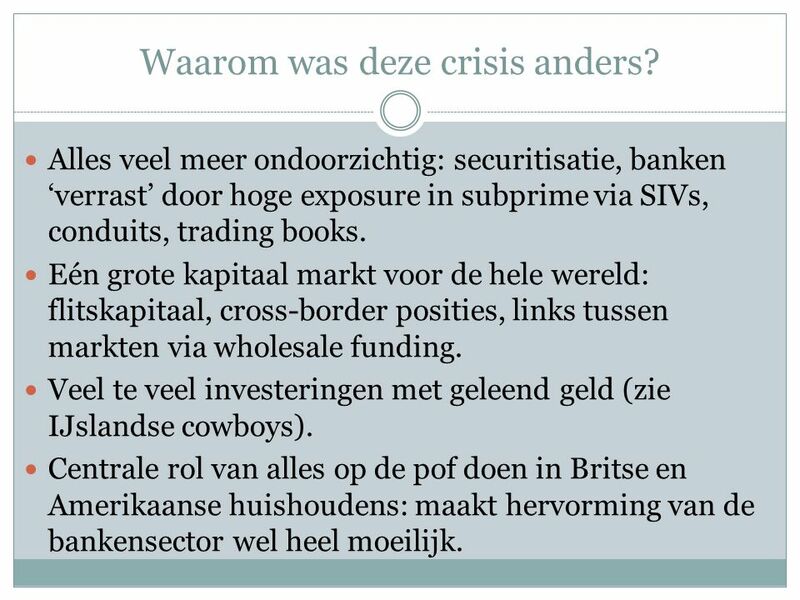 Alles veel meer ondoorzichtig: securitisatie, banken ‘verrast’ door hoge exposure in subprime via SIVs, conduits, trading books. Eén grote kapitaal markt voor de hele wereld: flitskapitaal, cross-border posities, links tussen markten via wholesale funding. Veel te veel investeringen met geleend geld (zie IJslandse cowboys). Centrale rol van alles op de pof doen in Britse en Amerikaanse huishoudens: maakt hervorming van de bankensector wel heel moeilijk. Vermijd rondshoppen bij toezichthouders (leidt tot schaduw bancair systeem en overmatig lenen), dus coordineer financiële regulering en toezicht. Regulering en toezicht kan het veranderende financiële landschap van al die nieuwe produkten niet bijhouden. Grizzlybeer! 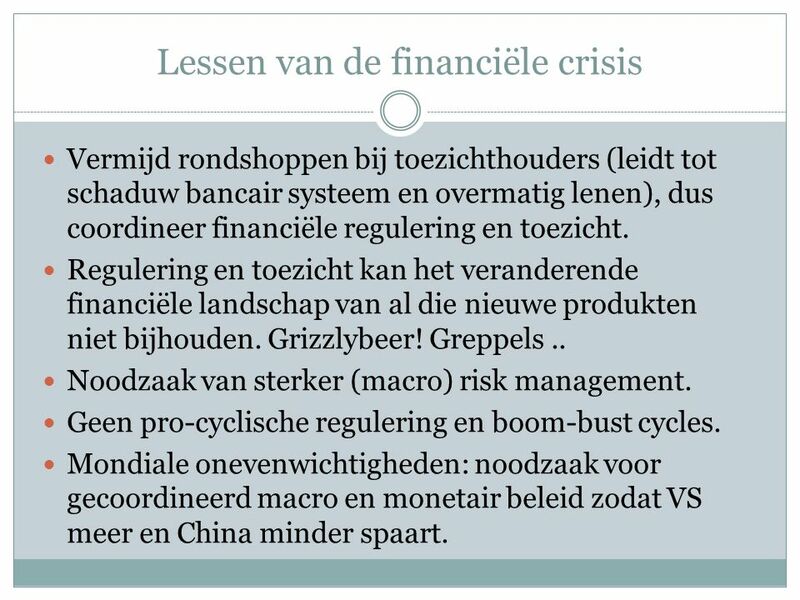 Greppels .. Noodzaak van sterker (macro) risk management. Geen pro-cyclische regulering en boom-bust cycles. 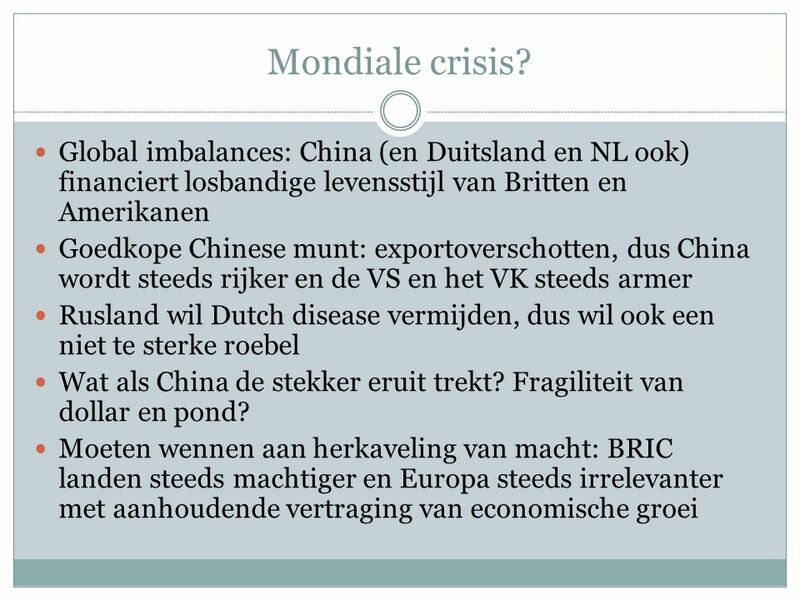 Mondiale onevenwichtigheden: noodzaak voor gecoordineerd macro en monetair beleid zodat VS meer en China minder spaart. Studeerde af in techniek in Delhi Chicago econoom Voormalig chef-econoom van IMF Waarschuwde voor aankomende crisis, maar niemand luisterde! 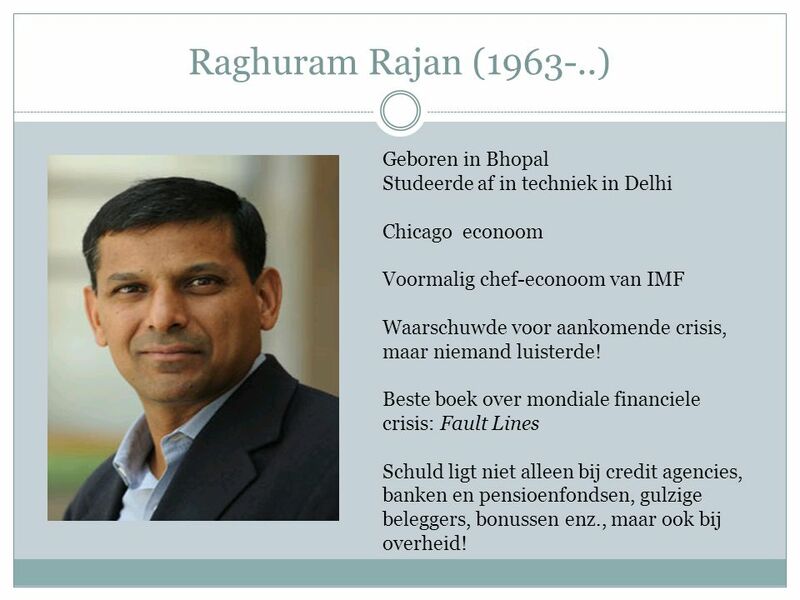 Beste boek over mondiale financiele crisis: Fault Lines Schuld ligt niet alleen bij credit agencies, banken en pensioenfondsen, gulzige beleggers, bonussen enz., maar ook bij overheid! 47 Dus doormodderen met knip? 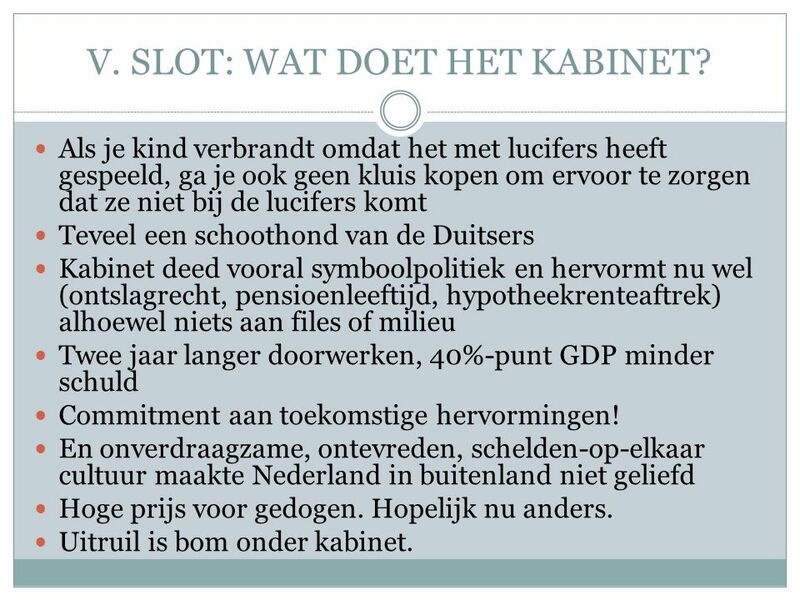 48 V. SLOT: WAT DOET HET KABINET? 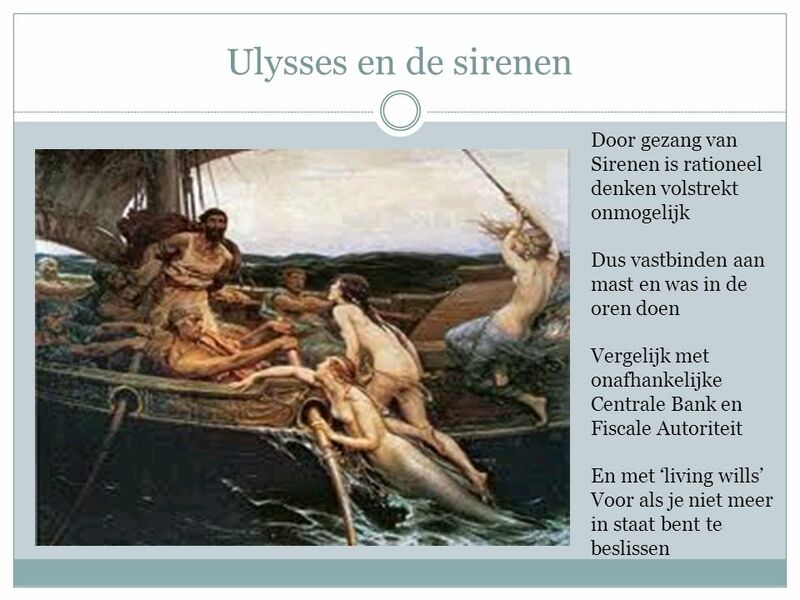 Als je kind verbrandt omdat het met lucifers heeft gespeeld, ga je ook geen kluis kopen om ervoor te zorgen dat ze niet bij de lucifers komt Teveel een schoothond van de Duitsers Kabinet deed vooral symboolpolitiek en hervormt nu wel (ontslagrecht, pensioenleeftijd, hypotheekrenteaftrek) alhoewel niets aan files of milieu Twee jaar langer doorwerken, 40%-punt GDP minder schuld Commitment aan toekomstige hervormingen! En onverdraagzame, ontevreden, schelden-op-elkaar cultuur maakte Nederland in buitenland niet geliefd Hoge prijs voor gedogen. Hopelijk nu anders. Uitruil is bom onder kabinet. 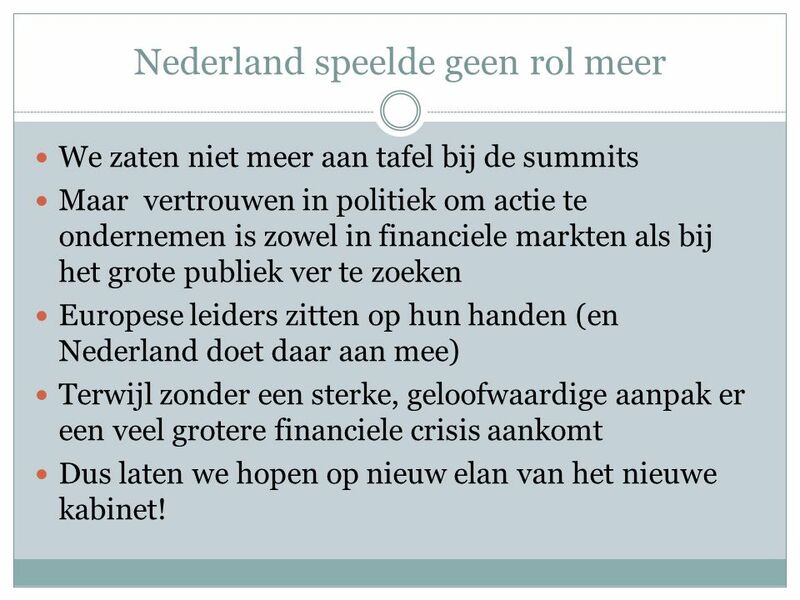 We zaten niet meer aan tafel bij de summits Maar vertrouwen in politiek om actie te ondernemen is zowel in financiele markten als bij het grote publiek ver te zoeken Europese leiders zitten op hun handen (en Nederland doet daar aan mee) Terwijl zonder een sterke, geloofwaardige aanpak er een veel grotere financiele crisis aankomt Dus laten we hopen op nieuw elan van het nieuwe kabinet! 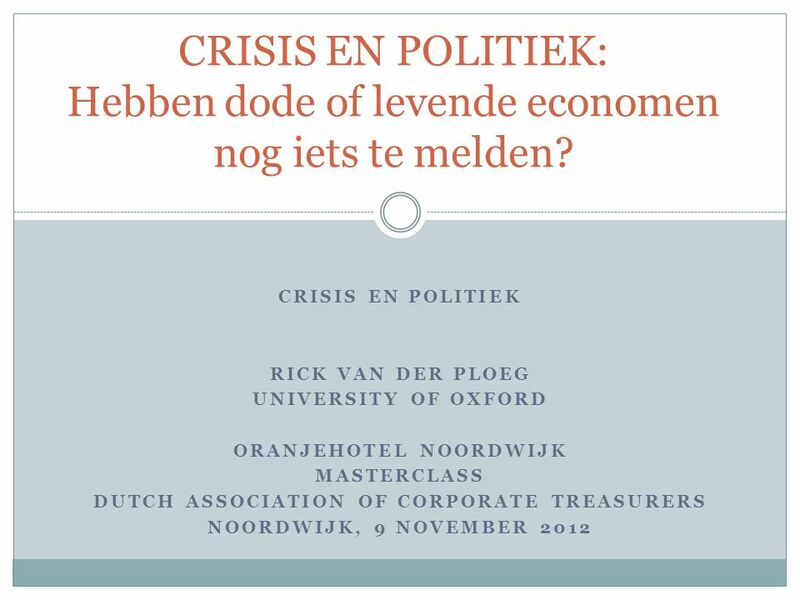 Download ppt "Oranjehotel noordwijk dutch association of corporate treasurers"
Europese Eenheid Dr. Hein Roelfsema Utrecht University School of Economics. 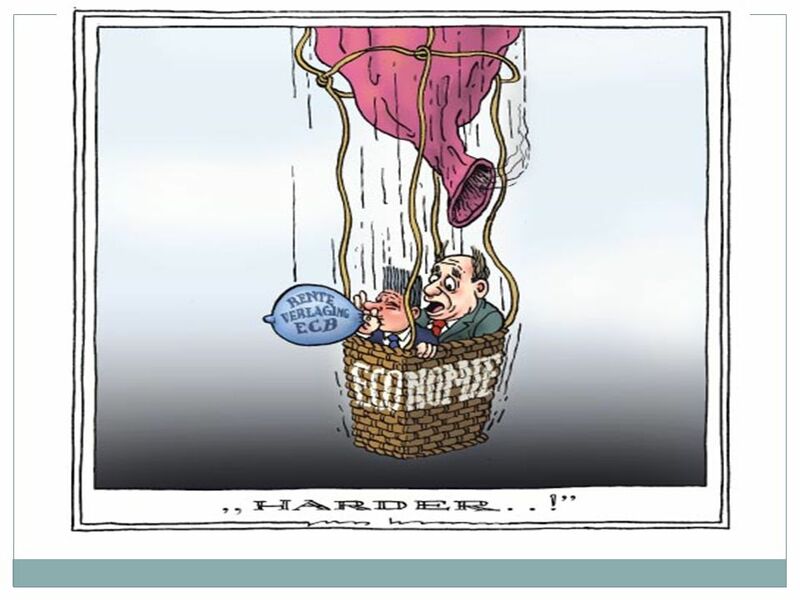 De € in historisch perspectief Fatale Vergissing OF Irrationeel succes ? Johan Van Overtveldt H oofdredacteur TRENDS Professor Universiteit Hasselt. 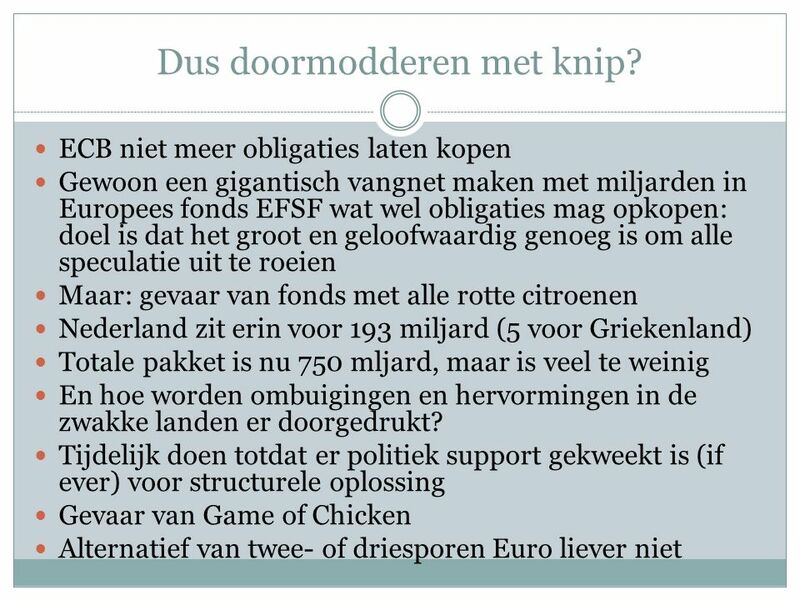 1 Michiel Verbeek November 2014 Waarom gaat de economie niet een beetje beter? Paragraph  People wanted to avoid war in the future.  League of Nations (1919) had failed.  In 1945: 2 nd try: United Nations.